If you want to generate affordable, high-quality contractor leads with your online marketing efforts, then high-converting landing pages are the way to go. Which is why, after building hundreds of landing pages both personally and alongside my design team, I’ve come up with a short list of 7 elements that we make sure to include on ALL the contractor landing pages we create. And today, I’m going to share those must-have elements with you so you can get more leads from your marketing budget. What the HECK is a landing page anyways? In short (no pun intended), a landing page is a mini website with a singular objective. That objective is to focus on ONE product or service as clearly and quickly as possible while directing visitors’ attention along the way to a tailored call-to-action. We’ve found landing pages to be a superior marketing tool when compared to full-blow contractor websites since the latter can be long, clunky, and take users time to find the information relevant to them. Time Magazine even posted an article alluding to the fact that people’s attention spans have dropped below that of a goldfish; less than 8 seconds! This is an important metric to consider regardless of whether you use landing pages or a full-blown website. Does this company offer the product or service I’m looking for? Why should I work with this company? These questions are the bread and butter of a successful landing page, and when coupled with a clean, modern, and easy-to-consume page design, you’ve got the winning recipe (little pun intended… I’ll stop)! 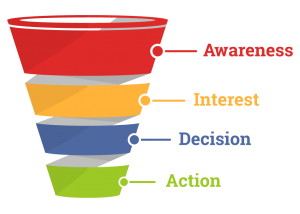 We refer to these potential leads as “bottom of the funnel” or being in the “decision” phase since they know what they need and are now looking for a company that’s the right fit. That being said, the job of a landing page isn’t to go into painstaking detail about the product or service but rather to just confirm that the visitor is in the right place, that you are the expert, the main benefits/highlights about the product or service, and why they should choose you over the last guy (or next guy). The key is to promote ONE product or service per landing page. This hyper-relevance will keep the page simple and short without overwhelming your visitors with useless information, which increases your chances of converting them into a lead. Just like on the worksite, you need to K.I.S.S. – Keep It Simple Stupid! That said, let’s have a look at the 7 must-have contractor landing page elements. Remember that goldfish attention span I mentioned? Well here is where the fish food hits the bowl… or something. The banner is the first thing a potential customer sees when they load your page and its important they know they’re in the right place. When someone makes a search on Google, it’s the equivalent to them asking for an answer to a problem they’re having. That’s where you enter the conversation. Your landing page needs to show them that you understand their pain and have a simple solution. Have a look at one of our recent clients landing pages to get a feel for what should be “above the fold”. A few things should jump out at you right away including; what they do, proof they’re good at it, and what’s in it for the customer. Let’s break down this section and see how it answers the four W’s; what, why, who, and where. The title should answer the “What?” question for the visitor has immediately. 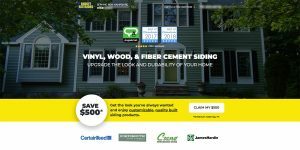 “Vinyl Siding” is clear and easy to read which assures that you do exactly what they need. This is reinforced by an example image in the background of a home with the product in use. Try to use an image of a real job you or your company has worked on. People can usually tell when an image has been purchased off the internet and it doesn’t help the trust factor. How will this product or service help me? The subtitle is a way to elaborate on your to-the-point title without cluttering the banner too much. Try to think of a short benefit someone will get by using your product or service. In this case, it’s how vinyl siding improves the aesthetics and quality of the home against the outside elements. Design tip: Visual hierarchy of text and elements is important to subconsciously direct the attention of the visitor where it needs to be at integral parts of the page. In graphic design, we refer to this and other useful theories of visual psychology as the Gestalt Principles. Here is a useful article on how these apply directly to website. Without cramming too much text into the banner, it’s a good idea to show that people trust your company and the work you do. If you’ve won awards, these are a great way to show that you’re active in your industry, that companies vouch for your services, and that you’re good at what you do. Also, a testimonial this early on the page would be great as it helps to connect with the visitor on a more humanized level. And by that, I mean potential customers will have a chance to see someone like themselves has worked with your company and had a positive experience. If you can’t fit in a testimonial, at the very least get a review or star rating in there somewhere. Go ahead and combine Google, Yelp, Houzz, etc. to bring the number of reviews up. The more the better. Whatever you do, don’t fake it. Consumers do their research! Pro tip: When you know your customer is happy with the work you’ve done, it’s a great time to ask them to say a few words about the experience. You can do this by either directing them to your Google my business page, email, text… The possibilities are endless. If you have the time and equipment however, video testimonials are fantastic for that goldfish attention span I keep blabbing about and gives a little extra credibility since they can put a face to the review. Promotions are arguably the most important ‘persuaders’ on the page and commonly referred to as the “unique selling proposition” (USP). We see much more success for our clients when they offer something of value to the customer. There are many reasons why giving something away is beneficial, but in a nutshell, who doesn’t love free stuff? Simply put, if you have something to give away, then you’re already ahead of your competitors who don’t. All else being equal, customers will choose the company that gives them an extra little some’n some’n. Name dropping is a great way to build credibility. However, choosing what logos to show will depend on your line of work. If you have some relevant clients you’ve worked with, ask them if you can use their logo on your page. Maybe you use products that people may be looking for specifically such as siding brands, paint companies, etc. The more recognizable the better! To help filter out unqualified visitors, its good practice to mention the areas you serve. This could be as simple as a small shoutout above the fold (i.e. “Serving New Hampshire”) seen in the top left of our example page. Depending on your company’s reach or specificity of the targeting, including a list of areas served somewhere on the page isn’t a bad idea either. The remainder of the page should be a similar flow and order of content as the above-the-fold section. It should be broken up into small bits of information about your services, their benefits, and social proof from people that have hired you for the same thing in the past. These pieces of information should be ordered from most to least important as you get further down the page. The order of these sections will obviously vary based on design, content, industry, etc. but just know that the important stuff should come first. The reason for that is, once again, because of that pesky goldfish-like attention span us humans have. In fact, according to ClickTale, after recording over 80,000+ random website interactions, less than 22% of people scrolled all the way to the bottom. Now i’m no math-magician… But that’s low. So reserve the top 50% of your page for the most crucial information. Anything that’s not relevant should be pushed down or cut out altogether. Immediately after the fold/banner area is a good time to elaborate more about what you offer. Again, depending on your industry, you’ll want to dig a little deeper into the actual product or service. If possible, accompany each item with a descriptive image to give context for those who won’t bother to read anything. Nothing will complement this section more than a great before and after representation of the work you can deliver as shown below. Seeing great transformations shows your ability and helps bring out the “I want that” feeling in potential customers. So if you’re not already doing it, start taking pictures of the jobs you’re on now. It’ll pay off in the end! You can never have too many testimonials. Now that you’ve explained the actual specifics involved in your product or service offering, throw a few more client reviews their way to show that real people have benefited from working with you. Other forms of social proof are logos, as i mentioned before, and star ratings from websites you are apart of such as Yelp, Houzz, Facebook, etc. The more you show the more credible you will look to a potential customer. Not unlike the social proof, you should always break up your content up with a clear and concise way for people to reach out to you. Here’s where you need to put your inner salesman to work. You can’t just slap a “submit” button on the page and think the leads will flood in. You’re going to need to do some coercing with the vocabulary here. Try to reiterate the promotion (USP) or the main benefit again with a button that is descriptive and ideally personalized. Using vocabulary like “my” or “me” has a positive effect when coupled with something the user will interact with, in this case a button. It helps give them a sense of control and involvement with the next steps. Again the best practise for CTA’s will depend on your industry. If you run an emergency restoration company you’ll probably want to get more phone calls and people will most likely be in more of a hurry. A roofer may want to know a thing or two about the job such as square footage or the type of building, so a contact form may be a better, so plan accordingly! At the risk of sounding too repetitive, people’s attention span is a factor even when it comes to contact forms. Too many forms fields will usually scare people off, as will asking questions that are too personal. Ask only what you absolutely need such as name, email, phone number, and a little bit about what they need. That being said, we’ve found that sometimes it’s helpful to include one question about the product you’re offering. The reason for this is, psychologically you’re letting them know that you’re asking these questions in order to do a job for them better by bringing the conversation back to the topic of the page, not to collect personal information and spam them later. Notice the button text isn’t something generic that a computer spit out—it’s more conversational. An important trend that will affect your web presence directly is whether or not your website/landing pages are mobile friendly. Google and other search engines have started penalizing web pages that are not built to work on phones and tablets which could cause you to leak money like a sieve. Depending on how old your website is, you may need to ask your friendly neighborhood web developer about media queries…they’ll know what to do! There are tons of online tools you can use to test your website mobile responsiveness, but this one from Google is more than enough for your needs. 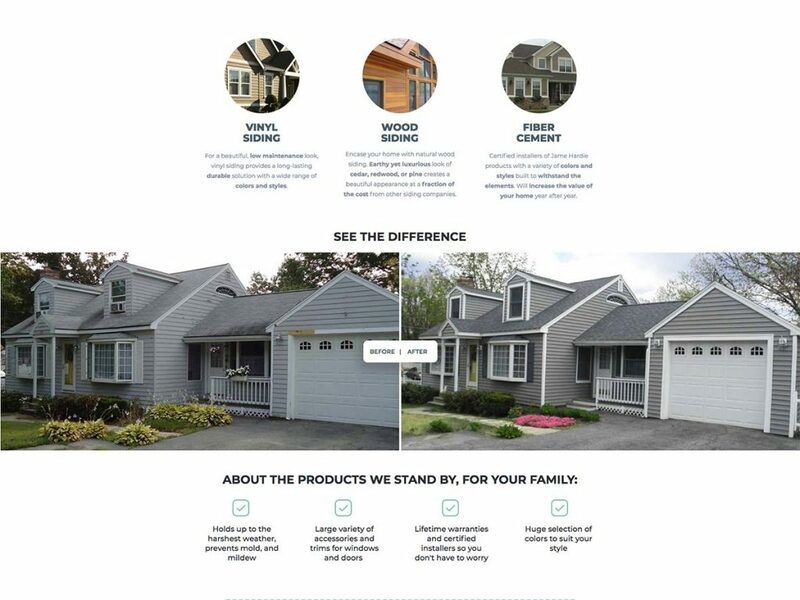 The example page we followed throughout this guide is a real siding company we work with. Before working with us, they were driving traffic to an outdated website with no quantifiable metrics for the marketing they were doing. Once they signed on as a customer, we got to work and built them new branded landing pages to increase their conversion rates. As of today, we’ve gotten their average conversion rate just over 7%, and it’s still climbing thanks to the on-going tests our team is carrying out. If you’re curious, have a look at the page in action here. Take note of how the sections are broken up, the frequency of CTA’s and testimonials, and just the overall flow of the page. So there you have it, the anatomy of a high-converting contractor landing page.